This Flagstone project pack contains 14 No. 600x600, 10 No. 600x300, 5 No. 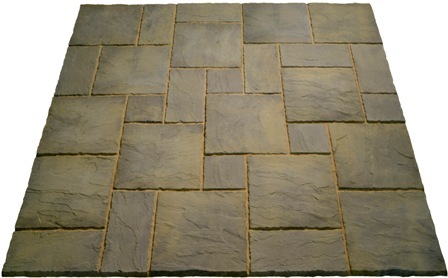 300x300 slabs and covers 7.3m2 (2700mmx2700mm) and is available in the three Flagstone colours. The following diagrams show a suggested random laying pattern and also shows how packs can be joined together by rotating and moving slabs to break up straight joints.